I have been DJing in clubs and house parties since the mid 80’s and specialize in weddings and quinceañeras. 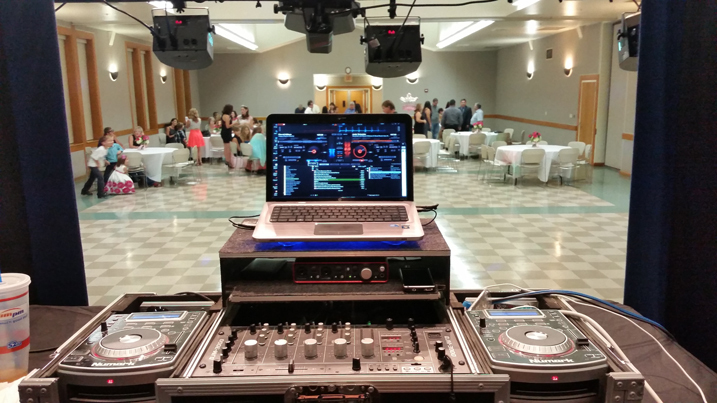 I have played at well over 500 formal events ranging from: Weddings, Corporate Events, Company Holiday Events, Quinceañeras, High School Dances, and clubs around the Los Angeles area. I learned on my own with help from the love that my family has for music and the drive I retain for entertaining people with music. When I first started playing, the music at the clubs was mostly disco and funk with a bit of house and at the weddings and quinceañeras you heard top 40 and spanish genre such as cumbia, merengue, and salsa. As a kid growing up I had plenty of time to practice my mixes at home so you can imagine how many hours was put into practicing what I do. I eventually converted my format to digital after realizing that DJ’s were going digital and I wasn’t going to be left behind. It was easy for me to learn the new digital formats such as RANE Serato Scratch Live and Virtual DJ. As I see it, Serato was designed for the club DJ as it quickly became the industry standard worldwide and Virtual DJ, in my opinion, was designed more for the mobile dj. I own both Serato and VDJ but I find that VDJ more suits my needs as a mobile dj, and not because of the automatic beat matching but because of the playlist when you just need songs played one after the other as for dinner music and such. I’m not limited to any genre but my personal preference would be tech house or deep house. My library consists of both clean versions and original versions as clubs play explicit versions and most of my parties prefer I play clean edits. I keep my sets current so I play the latest in dance music and always go back to the old school, which I know very well, as I started my dj career playing it. If you would like a list of my current rotation just contact me and I will email you my latest list of music. I also offer karaoke with huge collection of both english and spanish including the latest pop, rock, and hip hop but not limited to the oldies and classics. AJ Moroder © 2019. All Rights Reserved.